Essential Oils can create the perfect environment to energize yourself and help you to release stress. Did you know that energy levels are hugely important in our daily, active life? Our body needs to refuel, especially after dealing with our day to day pressures. Aromatherapy is so natural and can be used in your home, office, car or any place really. Stress is incredibly powerful and can create a negative effect on our body and inner strength. Essential oils will neutralise the harmful process of high level stress and increase our energy levels. Our body can replenish our energy levels, especially after a good night’s sleep but stress can cause sleepless nights that can play a big part in keeping you tired and agitated during the day time. With such a busy schedule, essential oils will certainly benefit a hectic lifestyle associated with work, pressures and deadlines. Mother nature can help you fight back! Diffusing Essential oils will permeate their wonderful aroma throughout the office and boost everyone’s mood. Pressures at work can be the most stressful parts of our day, so just a few drops of oil in your essential oil aroma diffuser or burner will greatly combat the high stress levels that rise during the busy working week. Your colleagues will also benefit and appreciate the beautiful smell drifting around the office, whilst eliminating some of the harsh office odours. Essential oils aren’t always pungent and overpowering, even though they can spread over long distances. There are others that are quite light and subtle too. Some essential oils are subtle and light but your sense of smell will still be able to pick up these lighter oils and create positive benefits to everyone. They’ll also increase energy levels, even at low levels and help you relax, de-stress and recuperate. Oils from Grapefruit, Pine and Litsea are well known to increase energy levels and you can use each one separately if you wish, or in combination for a full powered benefit. Each individual oil has its very own unique benefit, so in combination they can create a very powerful synergy together. I thoroughly enjoy a freshly, peeled grapefruit for a healthy morning breakfast. The tangy citrus flavour is uplifting with a stimulating effect from the citrus component of the fruit. Inhaling the grapefruit essential oil vapour will invigorate and create that wonderful feeling of refreshed energy. Who loves the aroma of a real christmas tree inside your home? I do! The smell from pine needles is second to none but the aroma of pine needle essential oil will not only act as a refreshing antiseptic, it will also clear your mind. This pleasant aroma will clear your head with only positive thoughts, making your body feel revitalized. The litsea cubeba is similar to a grapefruit, but less commonly known. Like the grapefruit, the litsea cubeba essential oil is uplifting, whilst making your body feel well balanced and strengthened. The gorgeous citrus lemon aroma brings a refreshing effect for increasing energy levels. 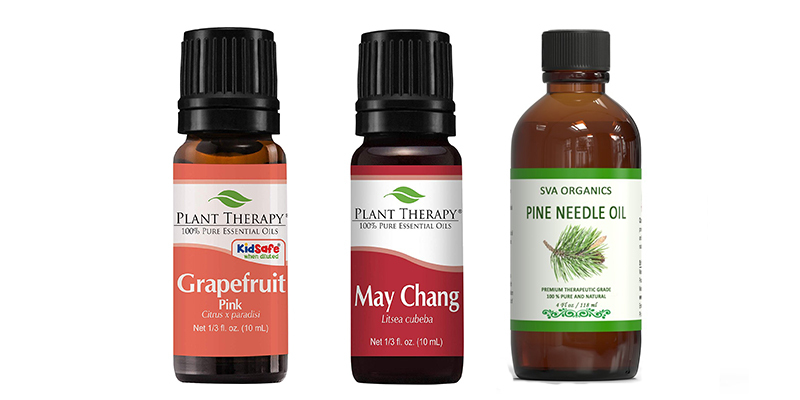 These natural essential oils bring each and every one of us an affordable and relaxing aromatherapy that can be used at home or in the office. If you use the three oils together, your mind, body and soul will feel totally refreshed and all those stresses during the day will disappear.